With the launch of Scrubby Dubby Saga, King has proved that a match-3 game doesn’t have to be all about gems. It can have a totally different theme and yet become more addictive than others. Instead of matching diamonds, rubies or candies, you will be sliding columns and rows to match colorful soaps. 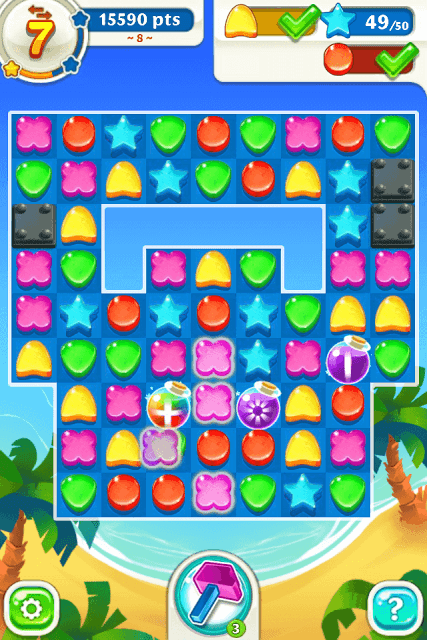 The soapy twist to the most popular puzzle genre has everyone hooked to the game and the unique line-sliding mechanics has made object-matching more engaging than ever. The charming visuals are a plus. Bubbly characters sport a magnificent 3D paper craft look and the level design is very eye catching. Scrubby Dubby Saga has plenty of challenging levels and quirky objectives to keep you busy for hours. With the help of these tips and strategies, you will be able to create more bottles, clear levels and rank up the real-time leaderboard. In most levels, your focus should only be on completing the objective. If the objective is to collect green and orange soaps, then the priority should be to match only those soaps. Don’t just tap on a bottle blindly. Look at the symbol etched on it and then make a move. If a row or column where the bottle appears has fewer of those target soaps, then try to make the bottle move to another area where there is more soap that you want to remove. Use rainbow bottles carefully as they have the biggest impact on a game board. Apply this tip to all objectives, such as levels that ask you to remove boxes or foam-filled levels. Your priority should be to match 4 or more soaps. Keep sliding rows and columns to get a bigger match. Tap, hold and slide a row and column to find a better soapy combo. If you can’t find them, then match 3 soaps of the same color. Matching four or more soaps will create a bottle which will let you clear an entire row and column. If you run out of lives, then you can ask for more lives from random players. Just tap on the plus button beside the heart icon on the map screen, and then tap on the “Ask Friends” button. Check “Select All” and press the “Send” button to request lives from players. If you want to request lives from your FB friends, connect to FB first by tapping on “Invite Friends”. Connecting to Facebook will also earn you 20 gold bars and let you play on multiple devices. Connecting to Facebook and inviting friends has another advantage. You can get your FB buddies’ help in unlocking new levels. Match 4 soaps of the same color to get a purple bottle. Notice the white vertical or horizontal line etched on it. A vertical white line will clear a column of soaps. A horizontal white line on a bottle will clear a row of soaps when you tap on it. Match 5 gems to get another purple bottle, but this time the bottle will have an explosion symbol, suggesting a mini-blast, which will remove soaps surrounding the bottle. Match two bottles with a horizontal or vertical sign on them to create a rainbow bottle with a plus sign. This colorful bottle will create a bigger explosion. Just swipe and move a purple bottle close to another purple bottle to create a rainbow bottle. A rainbow bottle with a plus symbol on it clears a row and column of soaps. Match a purple bottle with an explosion symbol (the one you get by matching 5 soaps) with a purple bottle that has a vertical line symbol. It will create a rainbow bottle that has three vertical lines on it. Tap on it to clear three columns of soaps. These include a column where the rainbow bottle is placed and two adjacent columns. Matching a purple bottle that has an explosion symbol with a bottle that has a horizontal line symbol creates a rainbow bottle with three horizontal lines on it. Tapping on this bottle will clear three rows of soaps. Matching two rainbow bottles that have an explosion symbol on them will create a new rainbow bottle with an explosion symbol. It will create a massive explosion, clearing half of the game board once you tap on it. In levels that ask you to free your friends trapped inside boxes, you will need to soaps with boxes of the same color. But if you have a bottle in the same row or column containing boxes, you just need to tap it to free your friends. You are lucky if you have more boxes and a bottle or two in the same row or column. Look for the symbol in your bottle and then tap on it. If it has a vertical line on it and the box is placed in a row containing boxes, then the bottle would be of no use as it would clear all soaps in a column. But if a bottle has a horizontal line etched on it and some boxes are in the same row as the box, then a gentle tap will remove them. Bottles can also be used to destroy crosses, which prevent lines from sliding. Tap on a bottle which is on the same column or row where the cross is placed to get rid of it. But again, check the symbol on a bottle to make sure it will clear a row or column containing the cross. Bottles can also remove foam filled tiles. Bottles cannot remove blockers. Those black boxes can only be removed if you match 3 or more same-colored soaps beside them. King has been a bit generous with those precious gold bars this time. Thanks to “Quests”, you can get them for free, but after completing a task. They could be anything ranging from collecting a certain number of soaps to reaching a particular level. As you progress, there will more challenging quests with bigger rewards. To access the Quest screen, tap on the shark icon on the map screen. In Scrubby Dubby Saga, you can use purchase lives and special power-ups like hammers.